Want to make your Windows desktop look better in just a few minutes? Our sister magazine Windows Vista: The Official Magazine has come up with eight ways to get a better looking desktop. Try these methods yourself and say goodbye to boring desktops! A great Microsoft application which lets you cycle between wallpapers automatically, meaning your desktop is always looking fresh and new. 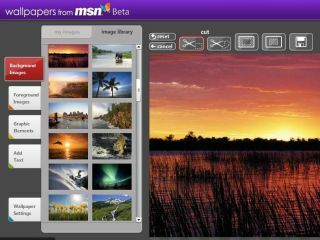 What's more MSN Wallpaper gives you over 100 high resolution wallpapers to get you started. Right click on an icon and click on Rename. Then using the number pad on the right-hand side of your keyboard, hold down the ALT key and type in numbers 255 and press enter. For the next icon write 255 twice, and so on until your desktop is text free. For a full guide on how to do this go to Nick's tutorial. If you like the look of the Apple side of the PC spectrum, there are plenty of ways to recreate this on your PC. ObjectDock and the impressive CircleDock are great places to start. Windows Vista Ultimate users can take advantage of a great selection of looping movie backgrounds called DreamScenes. There are loads available now, and there's no better way to bring some "Wow" to your desktop. If you're not running Windows Vista Ultimate then there are moving desktops available to download from StarDock. You can't have too many wallpapers, and there are some beautiful ones available for free on the internet. Artist Dan Proops created some great free abstract wallpapers, VladStudio has a wide range of funky desktop offerings and Hamad Darwish released some the stunning photos which didn't make it to the final release of Windows Vista. If you fancy making your desktop look a little different, then why not move it round. You can have your Sidebar on the left of your screen if you want to mix things up a little bit. There's not many customization options for the Windows Sidebar but a neat little application called Windows Sidebar Styler lets you resize your sidebar, and play around with many of the options. The How-to Geek has posted an excellent guide on how to make a button to toggle your desktop icons. If your screen looks unsightly this is a great way to sweep it under the carpet with a single click, and maintain the tidiest of desktops.